Internally, the OpenBLT bootloader is based on the XCP communication protocol. XCP is a point-to-point protocol for establishing a connection between a host PC and a microcontroller. Now consider a system with multiple nodes, where each node consists of a microcontroller running the OpenBLT bootloader. Can you still perform a firmware update on each individual node? The short answer is: Yes, you can. 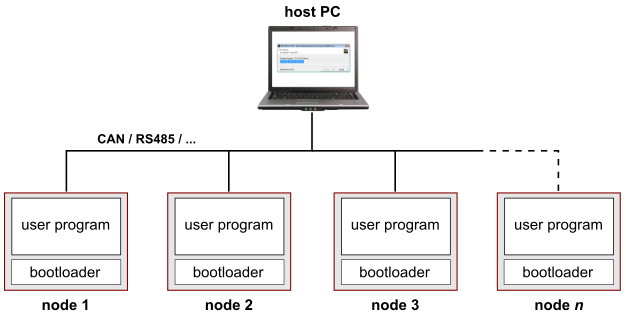 This article explains how to configure the bootloader for this purpose. There are several solutions for this scenario. For example, when the nodes are connected to a CAN network, you could assign a different pair of CAN identifiers per node for firmware update purposes. The solution presented in this article strives to be a more generic solution, independent of the communication transport layer. The foundation of this solution lies in the XCP connect-command. This is a two-byte XCP request packet that the host PC sends to the microcontroller to establish a connection. The first byte is the code of the connect-command, which is always 0xFF. The second byte is a so-called “connection mode”, which can be interpreted any way you like. In this article, the “connection mode”-byte will be interpreted as a node address. This enables up to 256 nodes to be individually addressed. The node addressing solution is explained with the help of the OpenBLT 1.5.0 demo programs for the Olimex STM32-P103 board, configured for building with the GNU ARM Embedded toolchain. In the example described in this article, it is assumed that multiple nodes are connected on a CAN network. The first step is therefore to prepare the bootloader for supporting firmware updates via CAN only. Open up the “blt_conf.h” configuration header-file in the source-code editor of your choice. It is located in directory: ./Target/Demo/ARMCM3_STM32F1_Olimex_STM32P103_GCC/Boot/. Next, rebuild the bootloader. This is achieved by running the command make clean allfrom the directory where the “blt_conf.h” configuration header-file is located. You now have a bootloader that supports firmware updates via CAN only. Note that the bootloader shrunk is size quite a bit too, as a side effect of disabling some functionality. Initially, it was about 20 kB and now it is less that 6 kB. The Olimex STM32-P103 demo programs are configured such that the first 24 kB of flash is reserved for the bootloader. This works fine for the example in this article, but theoretically this reserved amount of flash memory could be lowered. Refer to this blog article for details on how to reconfigure and optimize the bootloader for a low ROM footprint. *         time an XCP packet was received from the host. *         address of this specific node with this macro. ** \param     data Pointer to byte buffer with packet data. ** \param     len Number of bytes in the packet. The reconfiguration of the bootloader is now complete. All that needs to be done is building the bootloader by running the command make alland flashing the updated bootloader into the internal flash memory of the STM32F103 microcontroller, using a debugger interface such as a Segger J-Link or an ST-LINK. The demo user program contains functionality to detect new firmware update requests from the host PC. It does this by intercepting the previously described XCP connect-command. 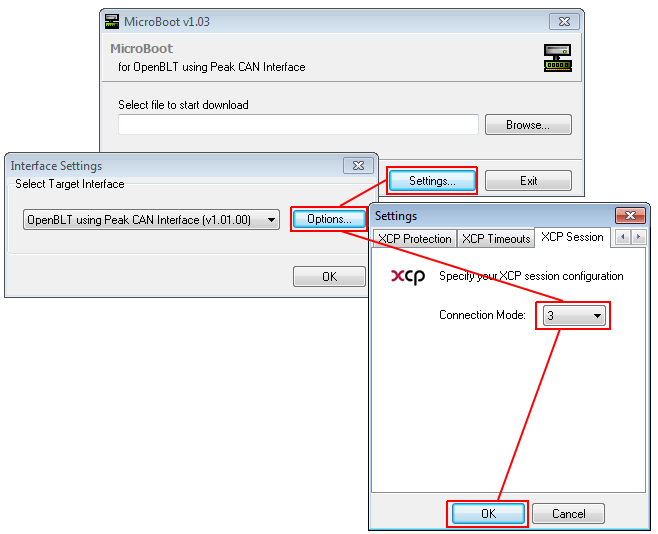 Upon detection of the XCP connect-command, it activates the bootloader by issuing a software reset. If the firmware update is not addressed to this node, the bootloader will ignore it and simply start the user program again. This logic works, but it does activate the bootloader unnecessarily. To prevent the bootloader from being activated for a firmware update that is not addressed to the node, open the “boot.c” source-file in your source-code editor. It is present in directory: ./Target/Demo/ARMCM3_STM32F1_Olimex_STM32P103_GCC/Prog/. This small change makes sure that the bootloader only gets activated when the firmware update is addressed to this node. Complete the changes by building the user program with the command make all. Now that the changes are made on the microcontroller side in both the bootloader and the user program, the last step is configuring the host PC tools to address the correct node. Remember that the solution presented in this article enters the node address value as the “connection mode”-byte in the XCP connect command. Both MicroBoot and BootCommander support the configuration of the “connection mode”-byte. To correctly address the node from the example in this article, the “connection mode”-byte should be set to 3, as this is the value we assigned to macro BOOT_XCP_CONNECT_MODE_NODE_ADDR. This article presented a solution for performing a firmware update on an individually addressed node in a network with multiple nodes. It is a generic solution independent of the communication transport layer. The code examples described the configuration of just one node for this purpose, however the same principle can be applied to all other network nodes, by just changing the node address value that was defined with macro BOOT_XCP_CONNECT_MODE_NODE_ADDR. Instead of a static node address value, macro BOOT_XCP_CONNECT_MODE_NODE_ADDRcould be used to read out the node address value from for example a fixed address location in EEPROM. This way the node address can be dynamically set. This entry was posted in OpenBLT and tagged CAN, multiple nodes, Olimex STM32-P103, openblt, RS485. Bookmark the permalink.